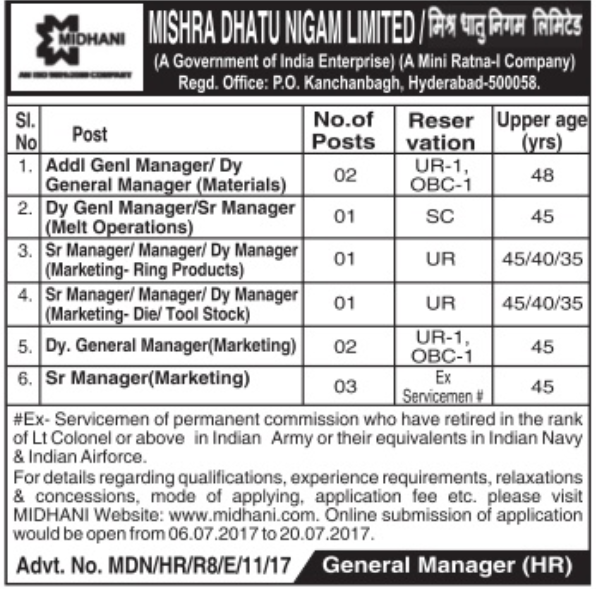 MDNL (Mishra Dhatu Nigam Limited) has recently Declared a Recruitment Positions For 10 ManagersPosts. If You are Interested In this Recruitment Positions then you can Apply for this Recruitment Online On Or Before 20-07-2017 (20th July 2017). 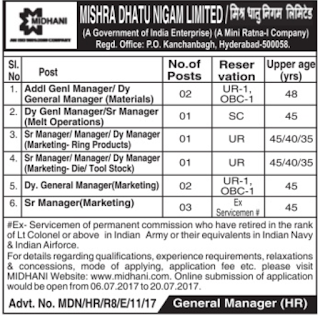 If you want to check the other Informations MDNL (Mishra Dhatu Nigam Limited) Recruitment 2017 – 10 Managers for these Posts Like Age limit, Way of Selection, Exam Pattern, its Syllabus, Education Qualification, then please complete Information to the end. How To Apply – All Eligible and Interested candidates may fill the online application through official website http://midhani.com before or on 20th July 2017. Opening Date of Online Registration of Application Form Is : 06-07-2017. Online Application Will Be Received Till : 20-07-2017.